Yearbook wants your Summer Photos and Stories! Summer is for adventures and making memories. Whether if it’s traveling or experiencing something new, if you would like to share your summer story and photos and have a chance at being included in the Yearbook, please fill out this Google form by Wednesday, Jan. 30th. Click here to see a list of photos we have received. If you do not provide us with a photo, we will use the LifeTouch photo you had taken at the beginning of the year at no cost or (gasp!) your school ID photo. **REMEMBER that Senior photos are due to the Yearbook staff by Wednesday, Oct. 31, 2018. Click here for information about submitting your Senior Photo ONLINE. Download the Group Senior Photo of the Class of 2018 for FREE! Click on the image below for a Low Resolution Image. SENIORS! Remember that Tuesday, Oct. 31, 2017 is the DEADLINE for submitting your SENIOR PHOTO for the YEARBOOK. If you do not provide us with a photo, we will use the LifeTouch photo you had taken at the beginning of the year or your school ID photo. 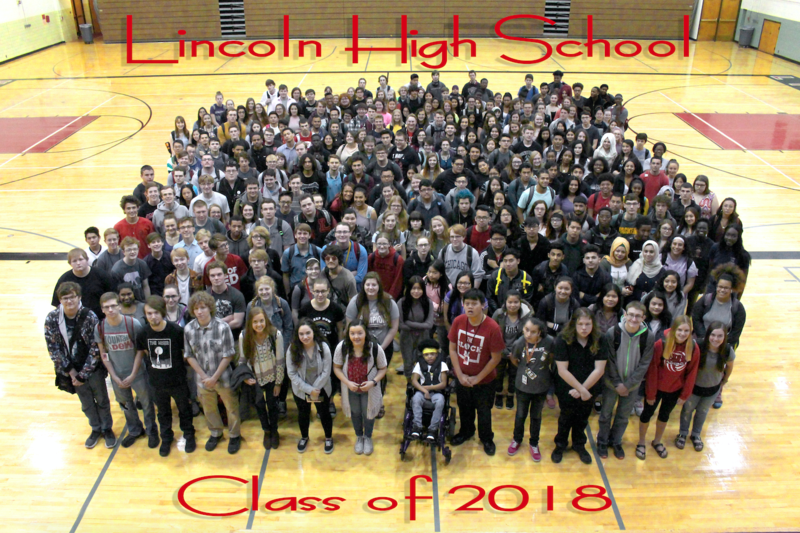 To avoid having to do that, the Lincoln High Yearbook Staff is offering a FREE Photo Shoot for your Senior Photo in the Yearbook. Stop by Room 308 after school any day this week and next week or during lunch. Click here for more information about submitting your Senior Photo. To upload photos, click here. **REMEMBER that Senior photos are due to the Yearbook staff by Tuesday, Oct. 31, 2017.
for the Early Bird Price of $65. for $70 until March 10th, 2018. We will only order the number of books we have pre-sold at that time and can’t guarantee any extras at the end of the year. 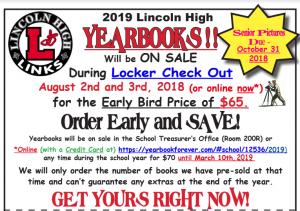 Email us if you have any questions: lhsyearbook@lps.org.